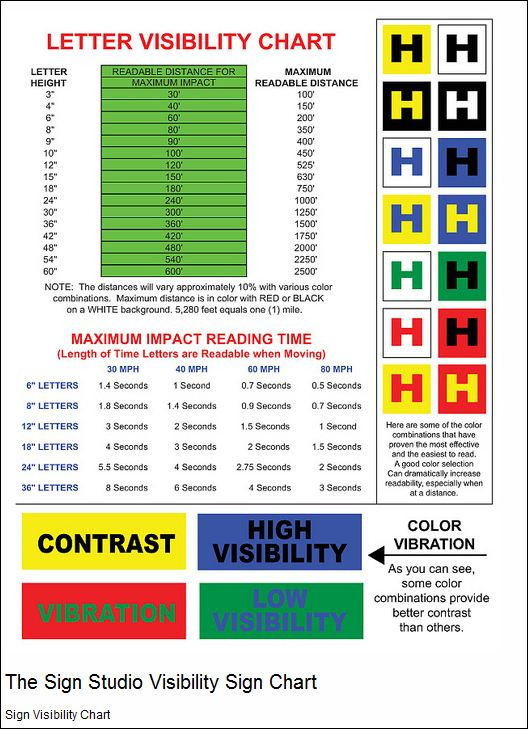 If you are looking for signage or even thinking of adding or replacing new or old signage, prepare a checklist after reviewing our "Letter Visibility Chart?" Have you ever wondered what the readable distance for maximum impact is? Make sure you review the "Length of Time Letters are Readable when Moving." Have you ever wondered what the maximum readable distance is? Is the maximum impact of reading time important to you (length of time letters are readable when moving?) Have you looked over or discussed color combinations that have proven the most effective and the easiest to read? If you haven't, it is important that you do your research first before you make any decisions. Remember, a good color selection can dramatically increase readability, especially when at a distance. Some color combinations provide better contrast than others. If you review the Letter Visibility Chart you will see some of the combinations and how much of a difference the combinations make. Before you make any decisions, please review our "Letter Visibility Chart." If you are confused or have any questions, please give us a call at The Sign Studio (818) 843-9200 or send us an e-mail at info@signstudiola.com.